The Australian Synchrotron User Meeting in November 2012 attracted an enthusiastic crowd of around 170 synchrotron experts, users and prospective users. The two-day meeting was the first such event to be held at the National Centre for Synchrotron Science (NCSS) on the Australian Synchrotron site in the Melbourne suburb of Clayton. Participants from around Australia were joined by 17 delegates from New Zealand, and 11 from other overseas countries such as Japan, Norway and Poland. Judging by the hum of conversation during breaks, participants took full advantage of the opportunities the meeting provided for sharing research experiences and discussing future collaborations. Presentations by plenary speakers from the US, Canada and Germany were complemented by 17 invited speakers, 39 additional oral presentations and 70 posters featuring synchrotron research projects. The event was organised by the User Advisory Committee (UAC) and the AS External Relations team. The meeting commenced with a welcome from the Chair of the UAC, Richard Garrett. Richard was followed by AS Director Keith Nugent, ANSTO Chief Executive Officer Adi Paterson and AS Head of Science Andrew Peele, who provided an update on AS developments over the last 12 months and discussed the transition to a much closer operational relationship between AS and ANSTO. Invited speaker Professor Janet Smith from the University of Michigan and GM/CA@APS, USA, gave the meeting’s first presentation on the absorbing topic of ‘Expanding the envelope of structural biology with micro-crystallography’. Protein crystals offer many challenges to crystallographers. They are radiation-sensitive, often very small (e.g. 20 micrometres or less), inhomogeneous, and diffract x-rays weakly. The development of dedicated, user-friendly, micro-crystallography beamlines with brilliant x-ray beams less than 20 μm (micrometres) in diameter means that samples not amenable to traditional large-beam crystallography can now be used to determine structures. Light source improvements, including top-up operations (thermal stability for optical components), reduced emittance (more photons, smaller beam) and greater stability, have been critical to the success of micro-crystallography. Janet has learned from five years experience with the 5-μm / 10-μm / 20-μm mini-beam at the APS that rapid change of beam size is an essential tool. Most user groups bring several projects, each with its own sample issues, and spend most of their beam time in sample screening in order to do the best experiment on the best samples for each project. Every group uses several beam sizes. Janet concluded by defining the ‘new normal’ for crystallography, which entails more crystal screening, more micro-crystallography, more partial data sets, and synergy with high-speed detectors. She highlighted the need to rapidly tailor the beam to the crystal, and the need for data processing and data assembly pipelines. On the second day of the User Meeting, Professor Adam Hitchcock from McMaster University, Canada, presented the morning’s plenary lecture on current capabilities and future trends in soft x-ray scanning transmission x-ray microscopy (STXM). Combined with recent developments in practical electron and x-ray fluorescence yield detectors and implementation of related techniques such as ptychography, this method is more appropriately referred to as scanning x-ray microscopy (SXM). SXM imaging and near edge x-ray absorption (NEXAFS) spectroscopy provide speciation, and quantitative mapping of chemistry and orientation (both geometric and magnetic) in two and three dimensions with spatial resolution below 20 nanometres. A new branchline being developed on the Australian Synchrotron’s soft x-ray beamline will have capabilities in coherent diffraction imaging ptychography and conventional STXM. Adam offered several examples to illustrate the principles and performance of the technique. For example, researchers used soft x-ray STXM with XRF detection to look at arsenic problems in drinking water in Bangladesh and investigate possible abiotic and biological remediation methods for reducing As(V). The technique can produce 3D maps of chemical species in a sample. Elsewhere, spectro-tomography has been used to look at synthesis and applications of wet, filled polymer latex particles. Other areas investigated include optimisation of catalyst-coated membranes in hydrogen fuel cells. X-ray magnetic circular dichroism has been used to study biomagnetism in magnetotactic bacteria, which use magnetite crystals (30-60 nanometres across) to help them navigate to favourable habitation zones. Henry Chapman from the Center for Free-Electron Laser Science (CFEL) at DESY and the University of Hamburg, Germany, gave the final plenary session on the exciting topic of ‘biological imaging beyond the limits’. X-ray sources have developed at a staggering pace since their discovery in 1895. X-ray free-electron lasers (FELs) produce extremely intense flashes of x-rays that can melt a hole through 3 mm of stainless steel in under a second – but can also elucidate the molecular structure of proteins and obtain images of virus particles far more delicate than steel. FELs enable atomic resolution imaging of biological macromolecules, collecting thousands of data sets from single molecules passed through an intense x-ray beam. A single ultrashort x-ray pulse applied to a room-temperature sample extracts diffraction information before the extreme radiation dose vaporises the molecule. Around 10,000 oriented patterns are required for a single structure, achievable with under 100,000 shots of a microjet containing 1010 crystal particles suspended in each ml of sample. Researchers obtain atomic-resolution information with pulses of 30 femtoseconds or shorter. Dubbed ‘diffraction before destruction’, the technique allows determination to 2 Å resolution of the molecular structures of proteins that cannot be grown into large enough crystals or are too radiation-sensitive for conventional x-ray crystallography. Serial femtosecond crystallography vastly expands the range of proteins that can be solved. With many groups collaborating on samples, sample delivery, analysis and theory, the method is now yielding new structures and has the potential to increase the rate at which structures can be solved. The User Meeting prize for the best student poster was awarded to Daniel Schauries from the Australian National University for his poster about SAXS studies of how temperature affects the formation of ion tracks in quartz and apatite. Ion tracks are narrow cylindrical defects a few nanometres wide and up to tens of micrometres long that result from high-energy heavy ions (such as uranium and gold) passing through a material. The radioactive decay of naturally-occurring uranium traces in minerals such as apatite causes a type of ion tracks called fission tracks. Fission tracks are used for determining the age and thermal history of geological samples, providing information to assist the modelling of sedimentary basins and long-term continental denudation. Fission track dating typically uses chemical etching to enlarge the tracks so they can be imaged with optical microscopy, but unfortunately this process completely erases their initial structure. A more-detailed understanding of the un-etched track morphology and its dependence on geological parameters could significantly improve current dating techniques. ANU researchers have previously shown that synchrotron-based small angle x-ray scattering (SAXS) is a powerful and non-destructive technique for studying ion tracks. 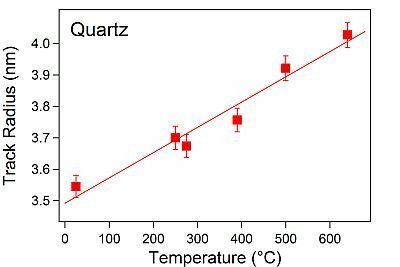 Daniel used SAXS to study how temperatures between room temperature and 650°C affect ion track formation in apatite and natural quartz. He found that track radius increases with increasing temperature, which is useful to know when dating naturally-occurring fission tracks formed at elevated temperatures in the earth’s crust, or assessing the radiation resistance of nuclear materials subjected to high temperatures and high-energy particles. In contrast, irradiation with low-energy ions at elevated temperatures leads to lower defect concentrations as a result of increased thermally-induced dynamic defect recovery. Above left: Two-dimensional SAXS pattern of highly oriented ion-tracks in apatite mineral. Image: Daniel Schauries. A post-conference survey found that 80 percent of respondents thought the meeting was ‘good’ or ‘excellent’. Eighty-three percent said the scientific content was good or excellent, with comments such as: “good speakers who could pitch their talks to an audience with wide-ranging interests”. Meeting attendees thought the most beneficial parts of the 2012 AS User Meeting were: chatting with colleagues, learning about other work, and attending presentations on techniques and skills. Most survey respondents were current or potential AS users. The NCSS was rated good or excellent as a location by 80 percent of respondents and the auditorium and the seminar room were generally well-regarded. The inflatable meeting room attracted a number of adverse comments due to the noise from the compressor, and the AS will investigate other options for the next user meeting. Many thanks to the UAC and External Relations teams for their efforts. Thank you to all participants for your support and we look forward to welcoming you again in 2013! The next User Meeting is scheduled to be held at the Australian Synchrotron on 21 and 22 November 2013.